14' x 27.5" x 6"
The next generation in SUP race board design. The hull shape is optimized for speed. Featuring a unique bow design that penetrates through waves allowing the board to drive and accelerate without pitching the bow and losing forward energy. The peaked deck design functions to shed water for smooth recovery. The tail is designed to minimize wetted surface area and drag, release water cleanly and to perform well while riding waves. Available in sizes 12'6 and 14'0. Overseas production: 1.5 Stringerless EPS core, carbon, wood veneer and fiberglass laminations. Machine shaped, hand finished. The nose: The nose is a development based on our work with racing catamarans. We call it a wave-piercing bow. The idea is to cut cleanly through the chop without adding a lot of drag. Essentially less water is pushed around as the bow penetrates through he wave and less of your paddling energy is used to propel the board forward. 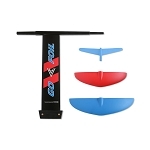 Tail: The tail is designed to minimize wetted surface and drag, release water cleanly, and to perform well when riding waves. We went for a wider tail than the zoom model so that the board surfs better and has more dynamic stability for open-ocean and surfing conditions like those encountered at the Battle of the Paddle. Rocker: The rocker line is a result of integrating the various shape details that make up the three dimensional shape of the board. We start out with certain shape parameters that are defined in order to maximize speed while maintaining the stability that is desired. We don’t start out with a particular rocker line in mind but let it evolve as we optimize the shape. All that said, the rocker line is a fairly smooth organic curve with maximum depth just behind the mid point of the board. Deck: The forward part of the deck is designed to shed water and is an extension of the wave piercing style nose. The standing area is fairly flat to allow excellent mobility while paddling and surfing waves. The standing area is recessed a bit to lower the paddler’s center of gravity.